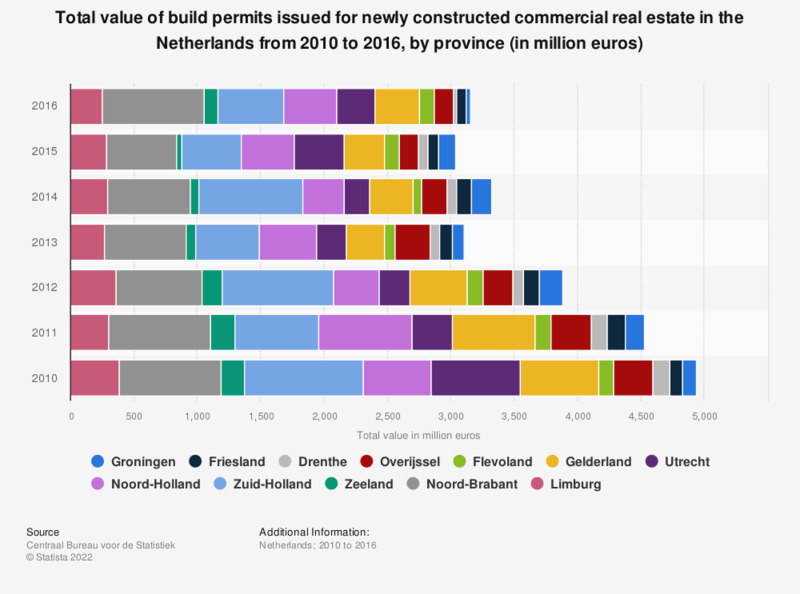 This statistic shows the total value of build permits issued for newly constructed commercial real estate in the Netherlands from 2010 to 2016, by province (in million euros). In 2016, the value of permits to construct new commercial real estate in the province of Groningen reached approximately 33 million euros. The source states, these building permits are issued for activities such as renovation, reconstruction and expansion. Moreover, one permit can be issued for multiple residential or commercial buildings. Commercial property includes combinations of commercial real estate with residential buildings, if the majority of the building value has a commercial purpose. These figures include building permits for warehouses, agricultural buildings, offices, schools, etc. Additionally, the source notes, these figures concern the value of permits at nominal prices, excluding VAT. Global Cities. The 2015 report. Would you agree that driven by increasing transparency and regulation the real estate industry will need to invest in procedures over the next five years?